Evie was an incredible baby. She was so happy, so loving and absolutely beautiful. 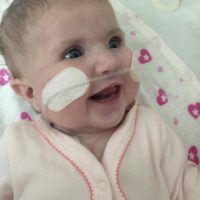 Evie spent the majority of her short life in hospital and was so adored by all the medical staff who cared for her due to her charming personality and gorgeous smile. Although she was only with us for 6 months she showed us so much of her personality, how she knew what she wanted (and usually got it! ), how she liked things to be done and what made her laugh! Her ability to communicate all this without being able to speak was remarkable. She was a joy to spend time with and filled many people hearts with love, hope and warmth. Evie was also very determined and incredibly brave, confronting all the challenges she faced head on. 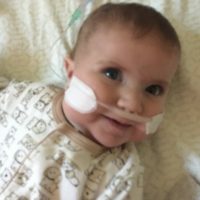 We were told before Evie was born that you can never account for the will of a baby, but no one could possibly have predicted the will and resolve Evie brought to the fight. 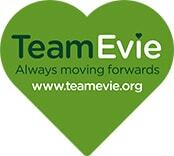 At the 20 week scan Evie was diagnosed with having congenital heart disease. She had dextrocardia (her heart was on the wrong side), a large VSD (hole in the heart) which could not be repaired and multiple problems with the way different veins and arteries were connected. We were told she would need to have three major operations to achieve a circulation which would work for her. 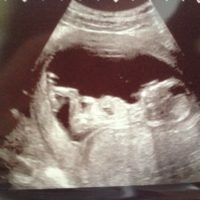 This meant she would have needed a heart transplant at some point…Later on in the pregnancy it became clear there was more than just heart problems as Jill was carrying so much extra fluid (polyhydramnios). 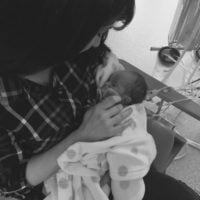 It was highly suspected that Evie would not be able to swallow, which would mean more surgery when she was very young. 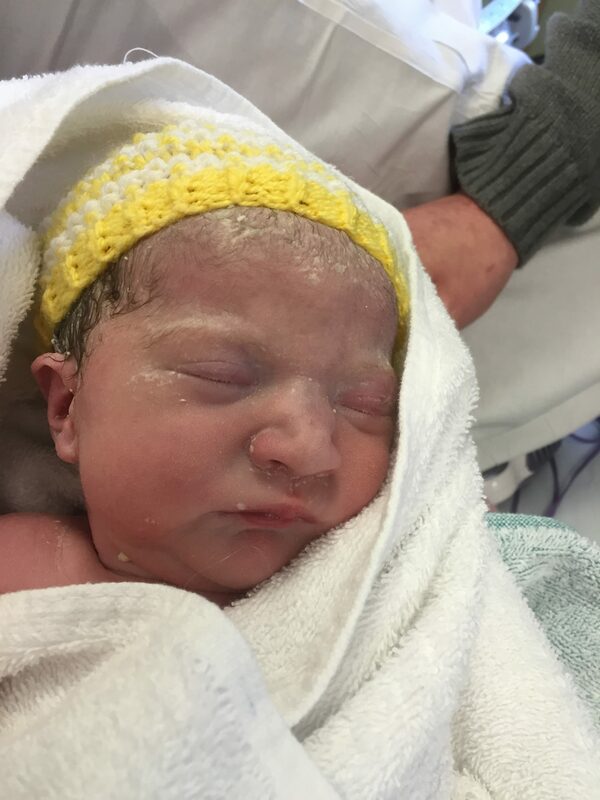 Evie was born on the 30th March 2015 at 2:42pm in the RVI in Newcastle and was admitted to the Special Care Baby Unit. It was confirmed that she indeed had a TOF (traceoesophageal fistula) which meant that she was breathing into her stomach and anything she swallowed could go into her lungs. She was rushed to theatre on the day she was born to have this repaired. 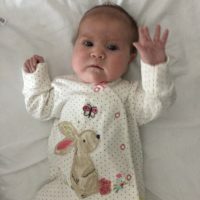 Unfortunately, although the operation saved her life, the surgeons could not repair the oesophagus to enable Evie to swallow, she would need to wait 3 months until it grew and then they could try again – we would need to be in hospital for this 3 month wait. Until then, Evie would be fed through a tube directly into her tummy. 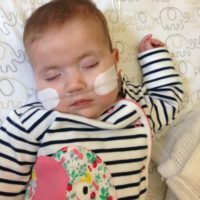 The top section of Evie’s oesophagus came to a blind end, like a pouch, which meant she was in constant danger of drowning from the saliva she swallowed. To keep her as safe as possible she had what is known as a replogle tube – a tube which went up her nose, down into the pouch and was on suction 24 hours a day removing saliva. Although it was a simple solution it was awful for Evie, not only the horrible and very loud noise it made, but the pain of it being continuously moved in and out of her nose to keep it clear and working. 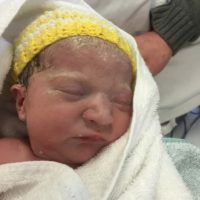 It was then discovered Evie had more digestive problems as there was a blockage in her intestines, known as a duodenal web – her second operation, still in her first week of life, relieved this. 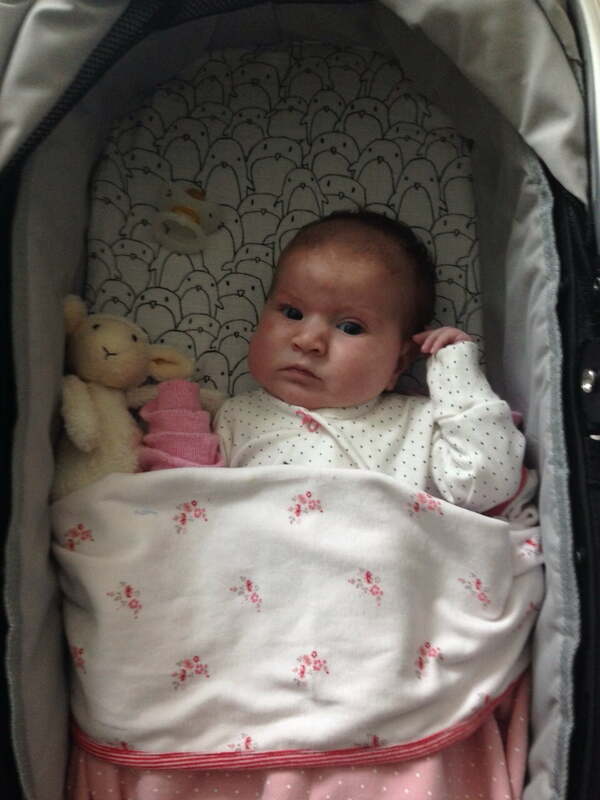 Evie was outgrowing her incubator in SCBU and due to her only being a couple of days premature she was transferred to the Paediatric Intensive Care Unit – this became her home for most of her life and the staff were like her (and our) family. 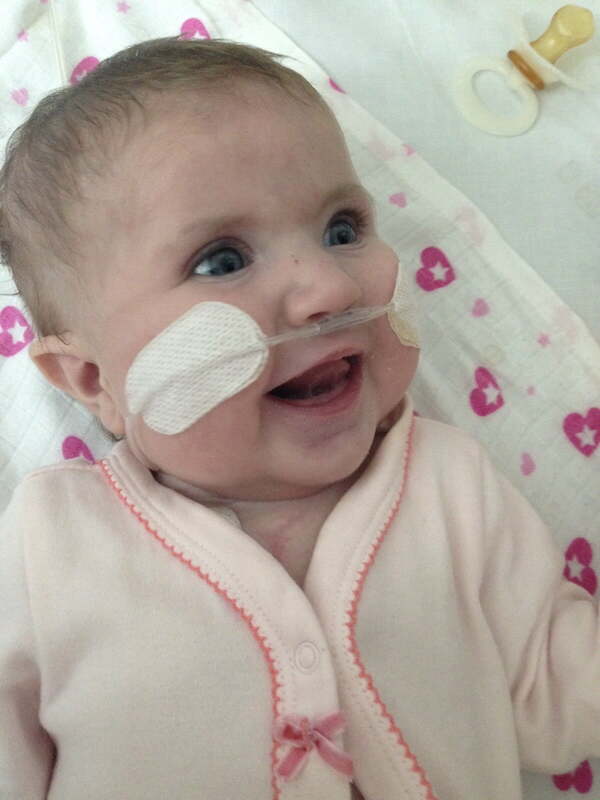 When she was 2 weeks old Evie suffered a respiratory and cardiac arrest. The doctors saved her but it was discovered that the TOF had re-grown (Evie’s surgeon described this as less likely than winning the lottery). Evie had yet more lifesaving emergency surgery. During the surgery it was discovered that her oesophagus was not growing sufficiently and that she would not be re-connected after the 3 month wait – it would be more like 9 – 12 months and would need very clever surgery to repair and enable her to swallow. It was then discovered that Evie had major breathing problems. Her airways were a strange shape and were small – she also only had one lung which worked properly. This was a major concern for the doctors as in order to have the heart operations you need a strong set of lungs. 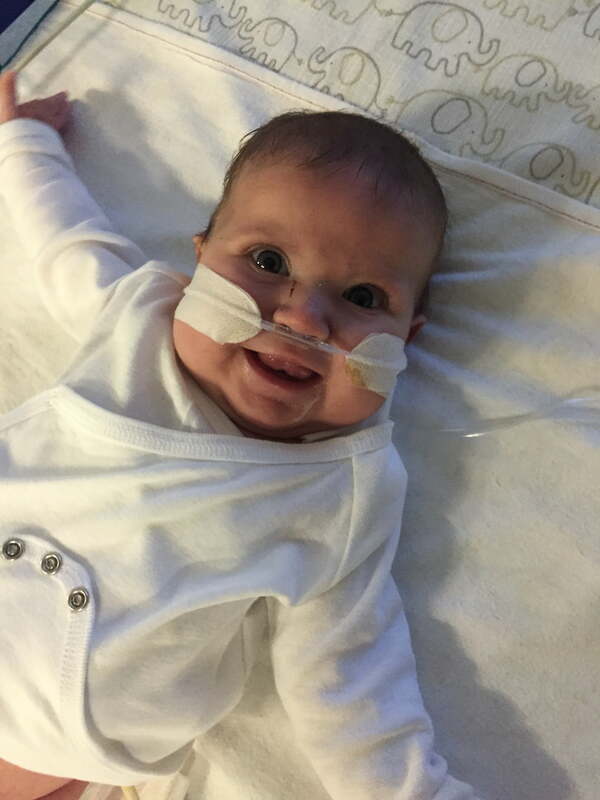 Evie then had her first major heart operation – where the surgeons at the Freeman put a band around her pulmonary artery to protect her lungs. This ‘bought time’ until she would need a procedure known as a Glenn to start altering her circulation. 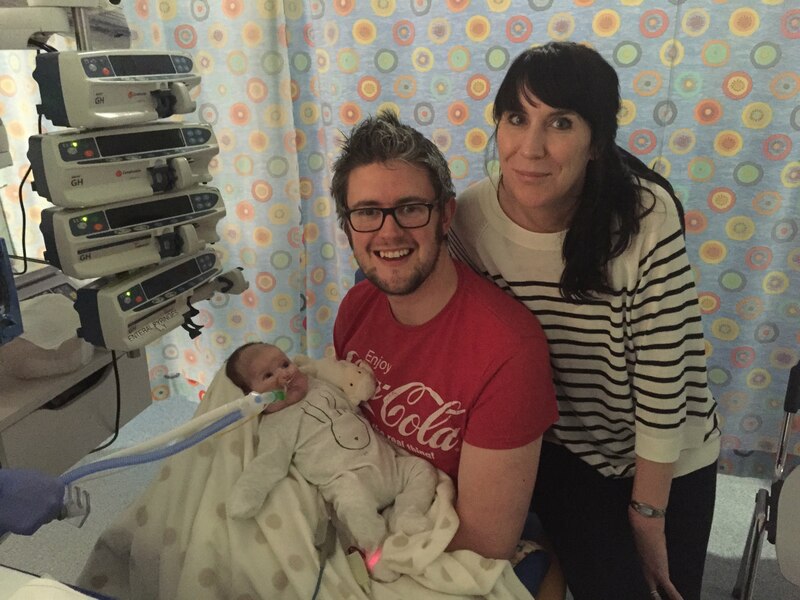 Evie returned to the RVI where she began to experience some difficulty with her breathing. 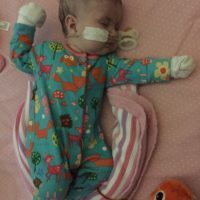 Evie was put onto the ventilator to help her breathe and the decision was taken for her to have a rare operation known as an oesophagostomy – this made her swallowing safe and gave us hope that at some point before the 9/12 month repair operation Evie would be able to make it home with us. It also meant she did not need the dreaded replogle tube anymore! 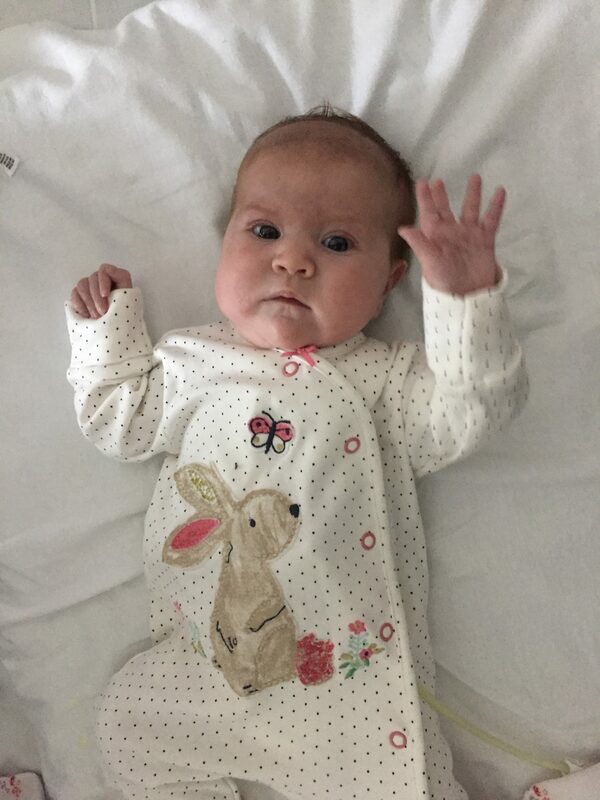 Evie made it off the ventilator for one night, she then deteriorated very quickly…It then became apparent that her chest had become infected when the wound from her heart operation opened up – this meant another emergency operation to save her by cleaning out all the infection. Evie didn’t really recover from this and the scar re-infected, meaning a transfer to the Freeman to have the same operation done again. This time it worked, but Evie needed a long course of very strong antibiotics to shift all the infection. 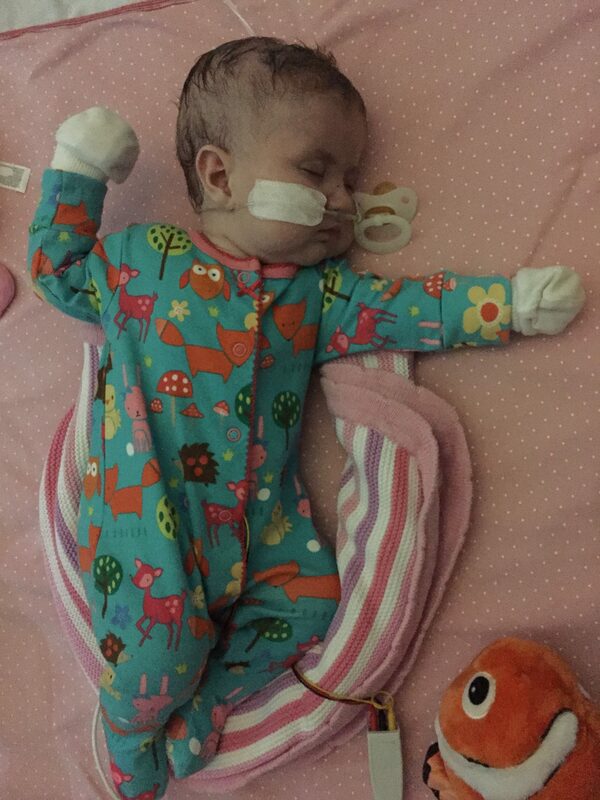 Evie was transferred back to the RVI to be supported with her breathing. 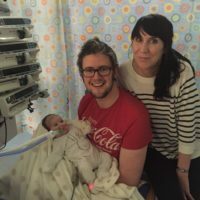 On the 25th June Evie was considered stable enough to leave intensive care for the first time in her life and we moved to the respiratory ward. 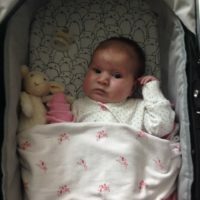 This was the first time we as parents were able to care for Evie, with one of us each night allowed to stay on the ward and look after Evie through the night, it started to feel like we were becoming a normal family… After many scans and x-rays on the 16th July Evie was discharged and we made it home! Whilst at home Evie needed around the clock care. With the support of our community nurse we managed Evie’s feeding routine and the huge amount of medicines she needed. After three precious weeks at home as a family Evie took very poorly in the early hours of August 6th. Whilst rushing her to West Cumberland Hospital she collapsed in the car, making it a terrifying journey. The team at Whitehaven stabilised her and told us she was showing signs of heart failure. We needed to be transferred to the Freeman, but they were full. 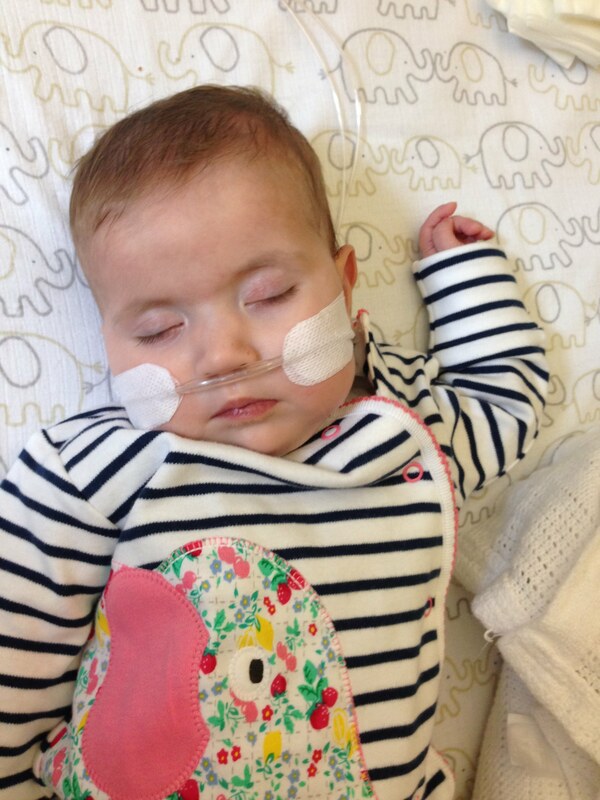 Evie was transferred over to the RVI to be cared for until there was space in the Freeman. 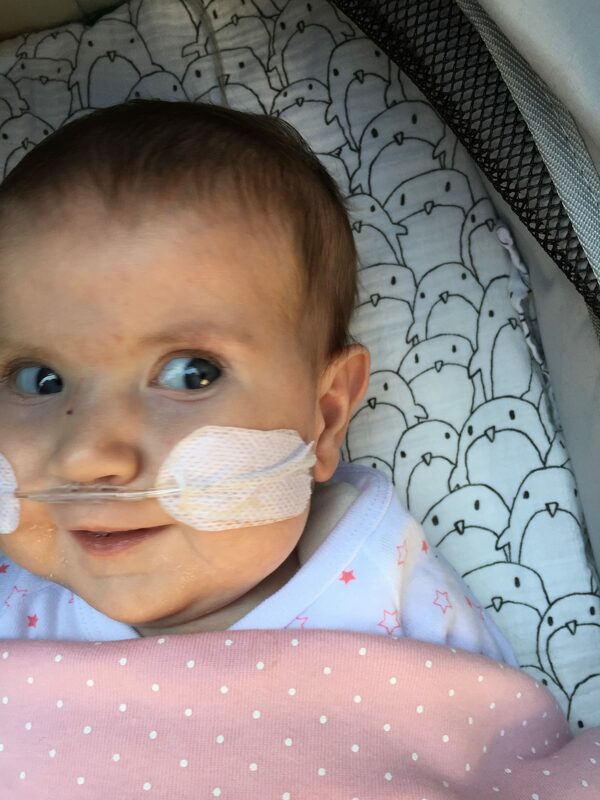 When Evie arrived at the Freeman she was diagnosed as having pulmonary vein stenosis – a very serious condition which basically means narrowing of veins, which put pressure on her lungs and heart. We were offered a very high risk operation and accepted, as the alternative was for Evie to be ‘kept comfortable’. Evie had the high risk operation on September 2nd. Following the operation she was critically ill and was kept sedated for a long time. Then, due to poor cardiac output Evie developed a life threatening condition called NEC (necrotising enterocolitis) and required emergency surgery to keep her alive. Concern grew about Evie’s lungs as it was discovered on a scan that her ‘good’ lung had started showing signs of being poorly – she was transferred back to the RVI intensive care to be under the care of the respiratory doctors, to try to get her well enough to be taken off the ventilator. 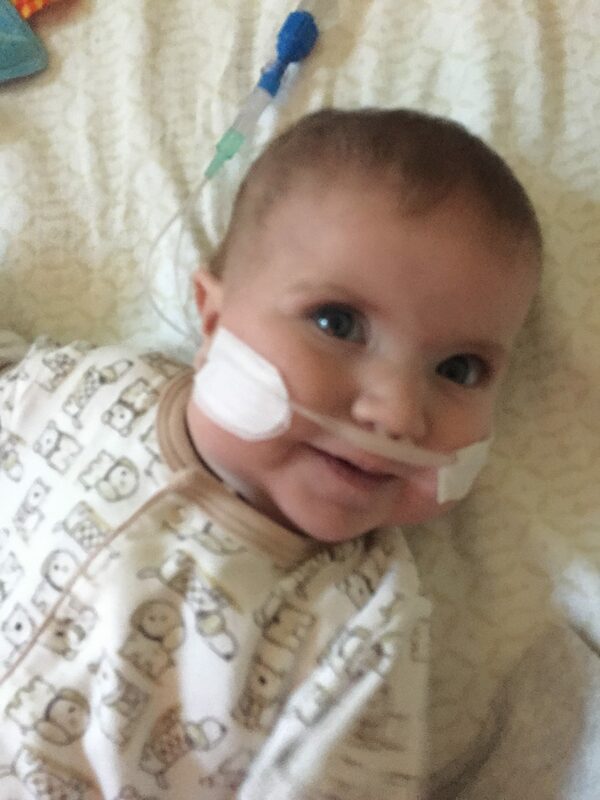 After a week of care it became clear that Evie was not going to get better and make it off the ventilator. She was struggling with her breathing, her circulation and was not able to digest food. She’d had enough of fighting. 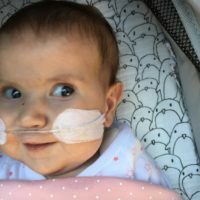 On Sunday 27th September Evie was taken off the ventilator and she slipped away peacefully in our arms… From the beginning we knew Evie was going to have medical problems. It was predicted that she would need 3 major operations to fix her circulation, but she actually had 4 open chest surgeries without ever making it to the Glenn procedure. 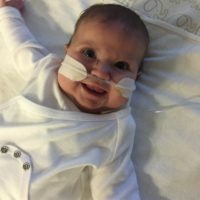 Evie went to theatre 14 times, something no-one could have predicted before she was born, she also had numerous blood and platelet transfusions.